Citrine is thought to dispel worry and eliminate self damaging tendencies. It is a symbol of success and happiness. It can help in building a strong emotional foundation which fosters a confident attitude in life. It also helps for you to dissipate and transmute negativity, and can assist one to release worry. It clears the aura and relieves tiredness, fortifies nerves and is good for the cardiovascular system, kidneys and liver. Above all, and most importantly to remember, citrine enhances healing energy and tissue renewal. Citrine is a variety of Quartz, and is yellow or yellow-orange in color, which I believe is one of the big reasons that it provides happiness and brightens one’s life. It also aids digestion and balances the thyroid. Amethyst is another gem that, among a number of other healing properties, can help heal grief. It is said to cleanse and transmute negativity, and provide a feeling of security and balance during transition periods. It reduces the feeling of being victimized, giving you a more spiritual perspective on life’s instances. Amethyst is said to help open channels associated with communication with angels, telepathy and other psychic capabilities, and thus an excellent stone pertaining to meditation or dream work, past life work, also to help you see your path. Many healers recommend this gemstone to help ease the pain associated with grief, personal loss, as well as promote happiness. Amethyst is reputed to be beneficial when dealing with legal problems and money issues, which can lead to affluence and abundance. Physically amethyst can help relieve headaches, insomnia, arthritis, circulatory system issues, endocrine system problems, diabetes, persistent fatigue, fibromyalgia, immune system deficiencies, asthma, phobias, pregnancy and general healing. The next crystal that I would like to mention for healing fear and grief is Rose Quartz, which is the gemstone that embodies the expression “Love Conquers All”. It is excellent for comforting the Heart and Solar Plexus chakras following situations involving emotional turbulence, chaos, trauma, or problems. Rose Quartz allows love to come to the wearers that have need of releasing traumas of the emotional sort or difficulty finding forgiveness. The energy of Rose Quartz is one of unconditional love, which reaches out and grows the heart so that there is area for forgiveness, love of self and others. There are many more gems that can heal, and I will be talking about them in my next post. For some of my healing creations, please see my website . Amethyst is for relaxation and contemplation… and even for remembering past lives. Possibly the most valuable thing we can derive from exploring past life memories is that we can focus on issues that seem to keep recurring and change them if necessary. It can bring us healing that otherwise may be difficult because it can help us recognize behavioral traits that we can then remove from our habitual tendencies. If you would like to begin to work with healing crystals, especially for the body, then amethyst is a good stone to start with. Using crystals in meditation helps the body and mind to relax . This gem has been highly valued since ancient times, and even during the Renaissance, it was considered to encourage self control and a spiritual outlook. It can calm emotions and balance energies which makes it a good all around healing stone.It can calm overactive thoughts and can help to calm the mind to be better able to sleep. “It has also been used to help ease the pain of grief, and promote happiness. Amethyst is reputed to be beneficial when dealing with legal problems, and money issues, which can lead to prosperity and abundance. Amethyst is most effective when worn as jewelry or placed on the body in the form of tumble stones and is most commonly placed on the crown chakra. and this could be a great way to start it off energized and in balance. resourcefulness, and also the ability to let go of the old in order to bring forth the new, whether they have to do with growth factors or in sustaining new ventures. Rose Quartz crystal, despite its soft and gentle color, has a very strong effect on the heart, which is in the heart chakra energy center in the body. passive, warm with cool, to encourage creative potential. crystals at the shoulder, solar plexus, and hip levels. 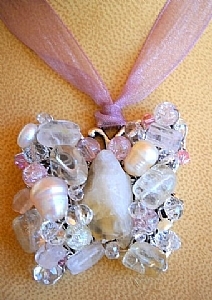 Place 3 Rose Quartz crystals on your LEFT side, at the same levels. Relax 10-15 minutes daily or as often as you feel the need. For some of my energetic jewelry, made with these crystals, please take a look here! Crystals can be a powerful boost in meditation practices, and simply holding one can help quiet the mind by focusing on the feeling and weight of it. This can set up an interaction by allowing the energies inherent in the crystalline structure to merge the electromagnetic field of your physical body. Actually, Quartz is particularly useful for meditation because it emanates a vibration that calms the body and energizes the mind at the same time. As crystals and human energy fields interact, a deep relaxation is felt in the body and the mind experiences what is called an inner focus. It is removed from but aware of the surroundings, and thoughts can begin to flow in and out of conscious awareness. When you have a particular problem take a few minutes to think about and define the problem first. The relax and hold the crystal, feeling it or gazing into its facets and slowly as your mind stills you may find a solution. If your solution is not clear after your meditation just let the problem go and very often within a short time, a solution will come to mind. It has been suggested that by holding a smoky quartz crystal in your left hand and a clear quartz crystal in your right hand, it creates a balanced dynamic energetic polarity that relaxes your body’s energy levels and enhances sensory awareness. Use the stones that are large enough to hold and feel in your hand. Choosing the ones that you like best are an important factor, they can be tumbled and smooth if you prefer or natural crystal shapes. Sit with or hold your crystal that can be specifically chosen to help you to harmonize with certain energies. For instance, rose quartz or kunzite can be used for love and compassion meditations. Citrine can be held for bringing your personal will into harmony with your soul purpose and help you to recognize that purpose. Green stones and /or amber or shells and fossils are used for meditations on nature and bring about a relaxation into that natural vibration. There are many lists and websites that will offer suggestions as to appropriate gemstones and crystals for specifically directed meditations. One of the first things to keep in mind for beginners is that one should simply enjoy the feeling of the stone and not have any particular objective, logic or judgment about the whole idea, just “be”, in serenity and stillness, and let thoughts flow in and out. You have to remember to stop yourself from being absorbed by any one thought or outside stimulation, and to return to your relaxation allowing sensations to come and go. It’s not important to blank your mind, which is extremely hard to do and discourages many from pursuing a meditation practice. Another idea is to move the crystal to where your awareness of stiffness or discomfort in your body is perceived. And if a noise or sound of traffic, footsteps, dripping water etc. is calling your attention, just go and focus on it, and then go back to your crystal and your relaxation. Simon and Sue Lilly, in their book Crystal Healing, suggest starting with what they call Crystal Gazing. You can have a sphere or a large crystal to “gaze” into to keep your attention. You simply stare into it and let it relax you, the idea is that the crystal makes it less likely to wander away in thought-trains, and if you do wander, it’s easy to go back and reconnect with the crystal again, floating away from the thoughts and back into the crystal itself. Even 5 or 10 minutes can be beneficial and can be repeated as often as you like. Crystals have acted as magical things throughout history, always playing an important and formidable role in eliciting help and gathering energy from a world beyond our normal senses. They are a perfect non-denominational tool for broadening our worlds and our perceptions. They create a clarity and peacefulness within us, when we allow them to enter into our day to day existence and lend a helping hand. I have been touching upon various subjects that crystals have been noted to assist one to take the step in self help area where it is most needed. I have discussed how they can help to eliminate nightmares, remember dreams and assist in getting rid of bad habits. I would like to continue with some other ideas in areas where crystals and gems can add to one’s repertoire of essential tools that can help to create a peaceful and happy existence. Moving forward in life requires a harmonious co-existence between what has gone before and what we expect to accomplish in the future. This means learning to let go of the old and embrace the new and improved patterns that knowledge of life has given us the possibility to utilize. This means keeping an open mind, and releasing some of the baggage that is totally useless in making full use of the new things we want to welcome into our lives. Human beings seem to be hot wired to accept and appreciate certainty and constancy, and to naturally reject upheaval and insecurity. Moving forward often requires us to change and eliminate some old habits of thought and action . It also requires a change in our self image and a release of our self created boundaries and limitations. We need help in breaking down those stubborn walls and limitations, and often, we need to redefine our existance in a more complete and whole-istic way. Crystal and gemstone therapists tend to set out many techniques that help to address the characteristics that we cling to, both the positive and the negative, that could well be preventing us from breaking behavioral patterns that we have built over a life time of experiences. For instance, many problems arise because we don’t have the experience and appropriate skills to deal with new situations or to block the old and unhelpful behavior patterns. 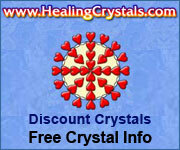 Crystal healing can help shift such obstacles by re balancing the energy centers of the body, called chakras. The more direct and specific the goals are , the easier it is to locate the block in the appropriate chakra that is obstructing the desired outcome. Here is an example from a kinesiology technique, which is derived from the Tibetan sources that identify specific energy loops in the body. In this example, to remove negative energy, a figure eight is used. This is because it creates a sweep of energy through and around the body.Doing so, it can dislodge inappropriate energy blocks and activate natural healing. It can reconnect the torn energies caused by illness or trauma, and can be used against sluggishness and lethargy in both mind and body. Select eleven crystals, either all smoky quartz or all black tourmaline. Arrange 10 stones all around yourself, so that when you lie down, be sure one is below your feet, 2 on each side of the torso, 2 on each side of the legs and one above the head. Place them all asymmetrically so the flow is more dynamic. Lie down and place the last stone on your abdomen, and lie there relaxing for 10 minutes, remove the stones, repeat for daily during stressful times. This exercise is from the book Crystal Healing by Simon and Sue Lilly, which is a most informative and practical guide. My jewelry collections that I have created utilizing healing gems and crystals can be seen and ordered here for specific needs.